meanwhile back in BROOKLYN . . .
BROOKLYN STREET ART presents SKEWVILLE live in action . . .
in honor of the big weekend-long – JUNE 16-19, 2011 – NORTHSIDE MUSIC & ART FEST !! SKEWVILLE – A TWIN COLLECTIVE – AD DEVILLE and his twin bro DROO – BORN & BRED IN QUEENS, NY & CURRENTLY BASED IN BUSHWICK – ARE GOING TO PUT UP – A HUGE NEW STREET MURAL – ON WILLIAMSBURGS’ NORTH SIDE. 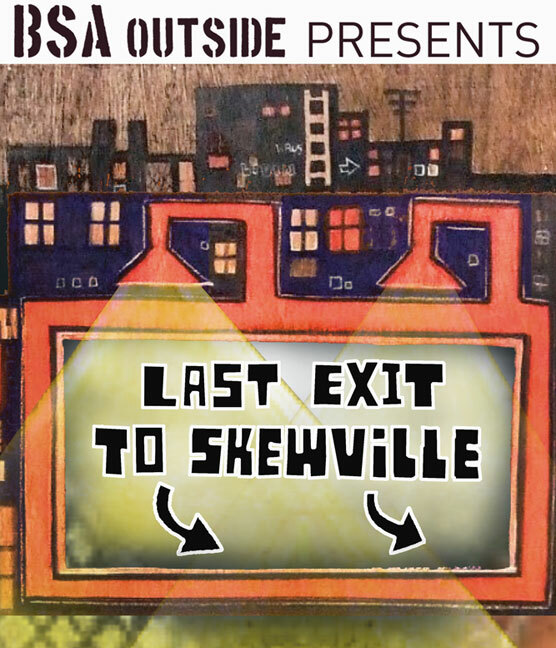 The 100 foot long wall to be called ‘LAST EXIT TO SKEWVILLE’ will pay tribute “to the cityscapes of industrial and everyday blue collar Brooklyn . . .” and will be located on NORTH 11th STREET . . .
to be exact: 82 North 11th Street, between Berry and Wythe – !! and, yeah, check out: SKEWVILLE ! !